Act Of God Documentary Film : Thunderstruck ϟ Quite Literally ! 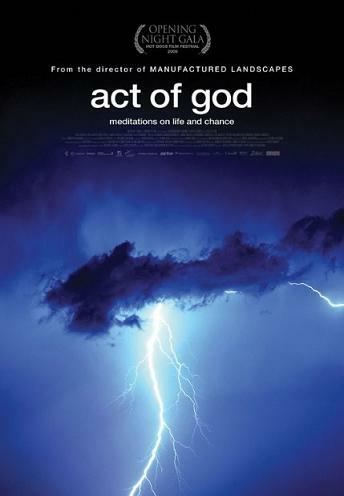 "Act of God" is a 2009 Canadian documentary film that investigates the "metaphysical" effects of being struck by lightning. Director Jennifer Baichwal questions whether being struck by lightning is a "random natural occurrence or a predestined event". The film contains seven stories in which Baichwal interviews people about their personal experiences with lightning strikes. She speaks to American novelist and screenwriter Paul Auster, Canadian dramatist James O'Reilly, and U.S. Marine veteran and author Dannion Brinkley. She also interviews a storm chaser in France, and a group of Mexican mothers who accept the loss of their children to lightning at a religious festival as "God's will". She also investigates a Yoruba religious community in Rwanda (the lightning capital of the world) who worship the lightning god Shango. The reactions in each of Baichwal's subjects varies considerably, from an "Act of God" to the "Mechanics of Reality". The Tibetan Book Of The Dead : Documentary Film !